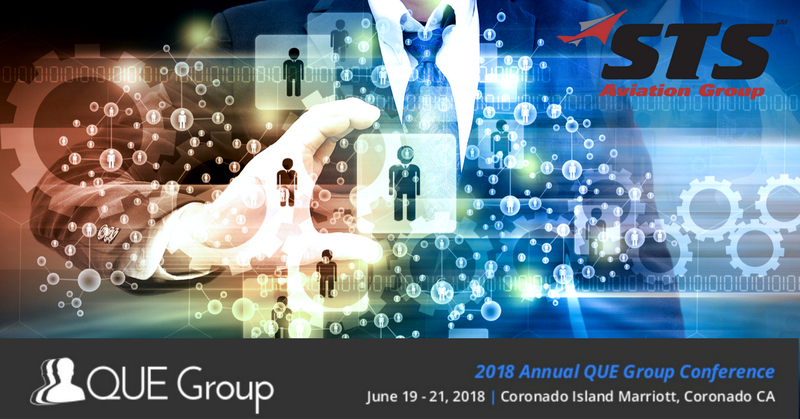 From June 19 – 21, STS Aviation Group will be heading west to sunny Coronado, CA where the company is set to attend the QUE Group 13th Annual Users Conference. The Quantum Users Exchange Group is where “Great Minds Think Alike!” The QUE Group holds this dynamic annual conference in San Diego, California where users and Component Control employees alike gather and discuss best practices, tips and techniques surrounding the use of the software in their various aviation organizations. This unique conference has evolved to be the world’s largest Aviation community gathering focused on the daily operation of many different aviation businesses. Companies from all over the world and of many types (MRO, Parts Traders, Brokers, Manufacturers, etc.) participate in the user forums both online and at the conference covering essential topics such as accounting, physical inventory, parts buying and selling, aircraft maintenance and parts repair. You can also expect technical topics such as system maintenance and backups or advanced reporting and software customization. You will have the opportunity to take part in different workshops, networking events and round table sessions that cover specific modules such as EDI integration, sales exchanges, repair management, physical & remote inventory and so much more! Current issues, participant solutions and requested enhancements are often acknowledged and discussed. You can view the event’s complete business agenda here. The group’s mission, as stated on the conference site, is to “make aviation businesses run better through shared user knowledge.” Without this shared knowledge and constant system improvements, critical advancements within the industry could not be made. STS Aviation Group is excited to attend this innovative event and is ready to take the wealth of knowledge back to headquarters, to apply throughout the organization and on to better serve our customers. We can’t wait to see everyone in California!